Leave Apt with the D22 in direction of Rustrel. 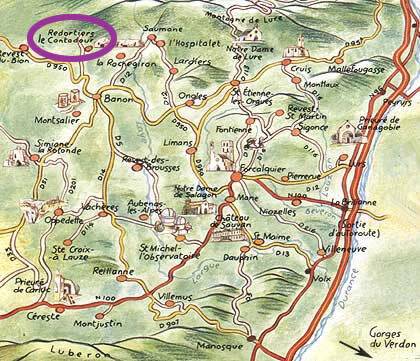 At the entrance of Rustrel, take the D51 to Banon, then the D950 in direction of Revest-du-Bion. After 8kms, you will pass a farm on the left of the road. 500m further, make a right turn on the path "Les Capellans". The guesthouse Le Clos de Peyron is on your right. Take the D950 to Banon, then keep it in the direction of Revest-du-Bion. After 8kms, you will pass a farm on the left of the road. 500m further, make a right turn on the path "Les Capellans". The guesthouse Le Clos de Peyron is on your right.